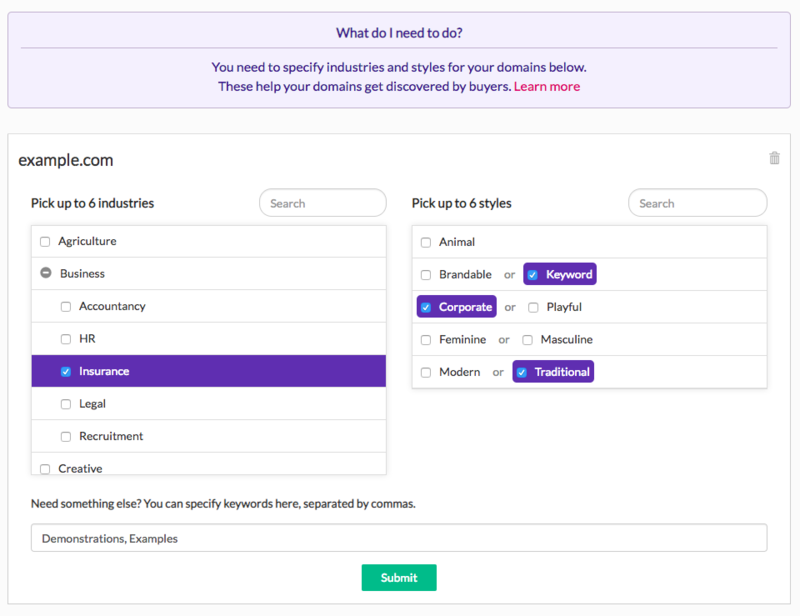 After your domains have been approved and paid for, you will be asked to tag them by industry and style. These are who the domain name is best suited for, e.g. Cryptobar.com probably suits Cryptocurrency and maybe also Security. You can scroll through a list of industries. Clicking on an industry will add or remove it from your selection. Some industries are nested in folders; you can’t select the folders, but you can click on them to see what industries are inside. You can search industries, and our search will find the best possible industry it can (e.g. if you search for “realtor” we may suggest “real estate”). Many industries appear inside several places, e.g. Analytics appears inside both Marketing and Technology. Selecting either of these automatically selects the other. You can select up to 6 industries. You don’t have to select any, e.g. if a domain is completely without any apparent purpose, but we recommend you select at least a few that the domain could suit. Doing this makes your domain more visible on our marketplace. These help users find domain names that match their personal taste, e.g. corporate or friendly names. Many of these options are mutually exclusive, so you can’t select say Feminine and Masculine at the same time. Sometimes you want to say something about a domain that doesn’t fit any of the above options. For this you can add your own keywords, separated by commas. If your domain contains specific words of value, we recommend adding them here if they weren’t covered by your industry. You might also want to add some more specific industry terms where appropriate. This system features industries and styles that do not currently match what Brandpa shows on its website. We are in the process of moving our old domain names to the new classifications, and expect to launch the new structure for all of our domains before the end of August 2018.